The Fort Worth Stock Show & Rodeo opened on January 17 and ran through February 8 with midway provided by Talley Amusements of Fort Worth, Texas. While cold weather affected the event during the weekdays, weekends had been beautiful weather when Carnival Magazine spoke with Mary Talley two weeks into the event. Weekday temperatures were so cold on certain weekdays that the midway could not open. High traffic weekend days, however, had been well-attended and the event was going well. Talley Amusements was happy with 2013 purchases, an SBF Groovy Bus and Chance Zumur. The Zumur was completely reconditioned by the show and Chance; it was also given a new light package from Denny’s Electronics. Dana Peck, owner of Midway Rides of Utica, reports that the show is refurbishing their High-Five Eli Wheel. The project will be completed in time for the 2014 season. Fair meetings in New York and Pennsylvania went well for the show. Already added for the 2014 season is the Crawford County Fair in Meadville, PA. The event is typically held in mid-August. Dana also reports that 2013 was a good year for the show. They were happy with the addition of a 90-foot, Wisdom Grand Wheel to their midway. Midway Rides of Utica is currently looking at options for new equipment. The San Joaquin County Fair has canceled their 2014 edition in large part due to loss of state funding. The fairgrounds are located in Stockton, California. The fair was established in 1860 and the 2014 edition was scheduled for June. Gearing up for the future after this year, organizers have hired a new director. Kelly Olds, a native of the area and veteran food industry executive, has already begun his new role at the San Joaquin Fair. Along with other organizers, Kelly is gearing up for a return of the fair in 2015. Powers Great American Midways is in the process of adding new equipment for the 2014 season. The show may be acquiring a new Cliff Hanger as well as negotiating for two new spectacular pieces. Manager of the Coastal Carolina Fair in the Charleston, SC region, Jerry Pitts, reports that January’s Georgia/South Carolina Fairs Conference went very well. A total of 34 fairs from both states were represented. The event’s trade show was booked to capacity and 11 carnivals showcased their business. Programs, speakers, and workshops were well planned, notes Jerry. The Iowa State Fair will continue to accept cash for food concessions and their permanent Giant Slide at their 2014 edition. 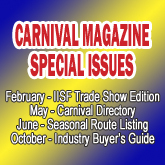 As reported in last month’s issue of Carnival Magazine, the fair had announced a plan to go cashless for food and the slide beginning this year, using a ticket/coupon system instead. The decision was met with objections from some vendors and members of the public who took to social media. Responding to the criticism, the Iowa State Fair decided to shelve the coupon system, but may return to a cashless plan in the future. Congratulations to David J. Garretson who was recently appointed Vice President of International Sales at Gold Medal Products Co. David began working at Gold Medal Products in 1990. Garretson has contributed greatly to international sales with Gold Medal over the years. According to the company, he has flown more than 1,300,000 miles around the world representing them since his first international trip to the UK in 1992. A brand new observation wheel built by Chance Rides will premiere at Washington D.C. area entertainment complex, National Harbor. The $15 million attraction will measure in at 175-feet tall. National Harbor is located in Prince George’s County, Maryland, not far from the hub of D.C. Views atop the wheel will include the National Mall and Andrews Air Force Base. CWA Construction of Switzerland is providing the 42 gondolas while Chance is producing all other major components. The wheel will include a $1 million LED light package. Chance has begun trucking components of the wheel to Maryland and construction is underway. Ray Pilszak, a veteran of Amusement Business magazine passed away on Saturday, January 18. He was known by many from all sectors of the outdoor amusement industry and spent many years at AB as a sales executive. Ray, a native of Chicago, was 82. He is survived by his wife, Georgia, and a daughter, Kirsa. Clarence Kasin, Jr. of Kasin Concessions passed away on Wednesday, January 22. He was born into the business on December 28, 1951 in Chicago, IL—son of Clarence Sr. and Mary Kasin. Along with his family, including brothers Peter and Paul, Clarence booked games with a number of carnivals over the decades. He was affectionately known as Coachie and he was at home managing his duck pond on the midway. Memorials may be made to the Showman’s League of America Scholarship c/o Peter Kasin. For more information please contact (847)223-8122.